Last weekend we managed to remove all the roof sheeting from the main garage and carport areas. I had also managed to dismantle much of the timber in the carport - but had to leave a tantilising amount behind at the end of Sunday. This weekend, I hoped to dismantle this in just a few hours and then move on to stripping out all the jarrah in the garage. Removing the carport timbers took me much of the day and then we proceeded to the cladding on the back wall. 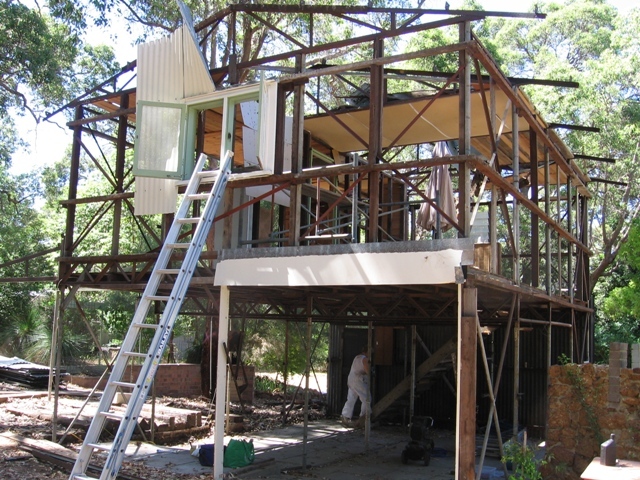 Sunday, I finished removing the cladding on the back wall and above the garage entrance and then stripped out much of the jarrah for the top back wall and lower back wall. Meanwhile I had Linda busy removing all the partitioning cladding upstairs. I hauled the rolling scaffold upstairs and pulled out all the ceiling - a mixture of carpet, pine boxing, cardboard, masonite. By 3.00 pm it became too hot. The trailer had a slightly flat tyre that I had remedied by bringing the compressor with me. 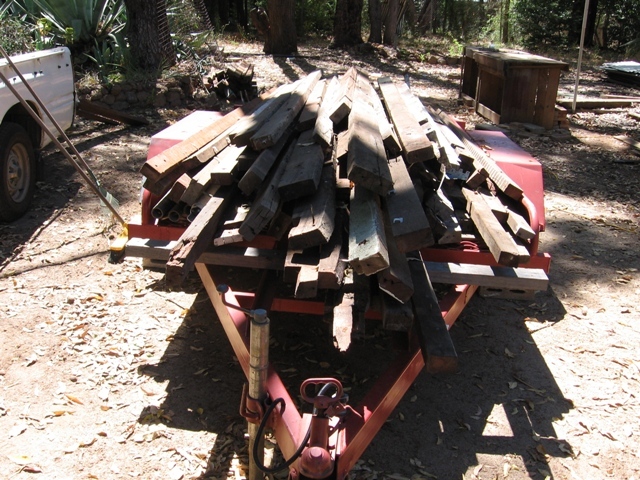 I decided to take that home, detach it and leave it there and then returned at 6.00 pm to load up the pile of shorter timbers I had left behind. The sun was still extremely fierce and I found myself consuming huge amounts of water. Went upstairs and finished stripping out the ceilings and knocked out the last of the partitioning - the garage is now pretty much a steel skeleton.